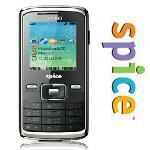 Spice Mobile has added another CDMA phone to their kitty with the launch of C-5300 dubbed as a complete entertainment phone for specially CDMA connection users. The C-5300 finally gives a choice to CDMA connection users to chose the handset of their choice and not be restricted to the feature deprived handsets that come bundled with operators. Not only you can choose the handset but the user will feel very liberated with the huge number of features that he is finally getting. Something that was completely missing in the bundled handsets available currently. A large phonebook with upto 1000phone numbers can be stored. An 1.8” screen with 65k color for bigger and brighter display. A 1000 mAh battery. Common problem of CDMA users that Battery backup is not good in CDMA handsets. Keeping this in mind, Spice has incorporated 1000 mAh battery which will give really good experience to user for talk time or listening to MP3 player / FM for long time. Smart Desktop which has the option to modify the default home screen to make it more jazzy and attracting. Expandable memory upto 1 GB for carrying music along with the go. Mobile Tracker so that you don’t loose your phone. MP3 player and FM Recording feature. The handset comes with a free USB card reader and is available for Rs 3,549. For more info on the handset click here.